The Mediterranean Sea is a sea of the Atlantic Ocean almost completely enclosed by land: on the north by Europe, on the south by Africa, and on the east by Asia. 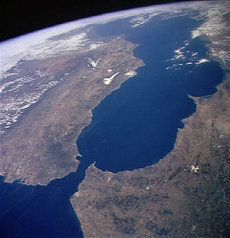 It covers an approximate area of 2.5 million km² (965 000 mi²), but its connection to the Atlantic (the Strait of Gibraltar) is only 14 km (9 mi) wide. In oceanography, it is sometimes called the Eurafrican Mediterranean Sea or the European Mediterranean Sea, to distinguish it from mediterranean seas elsewhere. It was a superhighway of transport in ancient times, allowing for trade and cultural exchange between emergent peoples of the region — the Mesopotamian, Egyptian, Semitic, Persian, Phoenician, Carthaginian, Greek, Roman and Turkish cultures. The history of the Mediterranean is important in understanding the origin and development of Western Civilization. The term Mediterranean derives from the Latin mediterraneus, 'inland' (medius, 'middle' + terra, 'land, earth'), in Greek "mesogeios". 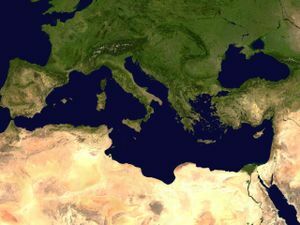 The Mediterranean Sea has been known by a number of alternative names throughout human history. It was, for example, commonly called Mare Nostrum (Latin, Our Sea), and occasionally Mare Internum by the Romans. ( Sallust, Jug. 17). In the Old Testament, on the west coast of the Holy Land, and therefore behind a person facing the east, it is called the "Hinder Sea", sometimes translated as "Western Sea", ( Deut. xi. 24; Joel, ii. 20), and also the "Sea of the Philistines" ( Exod. xxii. 81), because that people occupied a large portion of its shores near the Israelites. Mostly, however, it was the "Great Sea" ( Num. xxxiv. 6, 7; Josh. i. 4, ix. 1, xv. 47; Ezek. xlvii. 10, 15, 20), or simply "The Sea" ( 1 Kings, v. 9; comp. 1 Macc. xiv. 34. xv. 11). In Hebrew, it is called "ha-Yam ha-Tikhon" (הַיָּם הַתִּיכוֹן), "the middle sea", a literal adaptation of the German equivalent Mittelmeer. In Turkish, it is Akdeniz, "the white sea". In Arabic, it is Al-Baħr Al-Abyad Al-Muttawasit (البحر الأبيض المتوسط), "the middle white sea". Currently, "The Med" is a common British English contraction for the Mediterranean Sea and its surrounding regions when employed in informal speech. "The Med" (and more often "the Eastern Med" or "the Western Med") are almost to the exclusion of other terms in informal usage in the US Navy. The Mediterranean Sea is connected to the Atlantic Ocean by the Strait of Gibraltar on the west and to the Sea of Marmara and Black Sea, by the Dardanelles and the Bosporus respectively, on the east. The Sea of Marmara is often considered a part of the Mediterranean Sea, whereas the Black Sea is generally not. The man-made Suez Canal in the south-east connects the Mediterranean Sea with the Red Sea. Large islands in the Mediterranean include Cyprus, Crete, Euboea, Rhodes, Lesbos, Chios, Kefalonia and Corfu in the eastern Mediterranean; Sardinia, Corsica, Sicily, and Malta in the central Mediterranean; and Ibiza, Majorca and Minorca (the Balearic Islands) in the western Mediterranean. The Mediterranean climate is generally one of wet winters and hot, dry summers. Crops of the region include olives, grapes, oranges, tangerines, and cork. Being nearly landlocked affects the Mediterranean Sea's properties; for instance, tides are very limited as a result of the narrow connection with the Atlantic ocean. The Mediterranean is characterized and immediately recognized by its imposing deep blue colour, especially around Greek islands. Evaporation greatly exceeds precipitation and river runoff in the Mediterranean, a fact that is central to the water circulation within the basin. Evaporation is especially high in its eastern half, causing the water level to decrease and salinity to increase eastward. This pressure gradient pushes relatively cool, low-salinity water from the Atlantic across the basin; it warms and becomes saltier as it travels east, then sinks in the region of the Levant and circulates westward, to spill over the Strait of Gibraltar. Thus, seawater flow is eastward in the Strait's surface waters, and westward below; once in the open ocean, this chemically-distinct Mediterranean Intermediate Water can persist thousands of kilometers away from its source. Asia (from north to south): Turkey, Syria, Lebanon and Israel. Portugal, Armenia, Serbia and the Vatican City, although they do not border the sea, are often considered Mediterranean countries in a wider sense due to their Mediterranean climate, fauna and flora, and their cultural affinity with other Mediterranean countries. the Sea of Marmara between the Aegean and Black Seas. The geology of the Mediterranean is complex, involving the break-up and then collision of the African and Eurasian plates, and the Messinian Salinity Crisis in the late Miocene when the Mediterranean dried up. The Mediterranean Sea has an average depth of 1,500 m and the deepest recorded point is 5267 meters (about 3.27 miles) in the Calypso Deep in the Ionian Sea. The coastline extends for 46,000 km. A shallow submarine ridge (the Strait of Sicily) between the island of Sicily and the coast of Tunisia divides the sea in two main subregions (which in turn are divided into subdivisions), the Western Mediterranean and the Eastern Mediterranean. The Western Mediterranean covers an area of about 0.85 million km² and the Eastern Mediterranean about 1.65 million km². In the last few centuries, mankind has done much to alter Mediterranean geology. Structures have been built all along the coastlines, exacerbating and rerouting erosional patterns. Many pollution-producing boats travel the sea that unbalance the natural chemical ratios of the region. Beaches have been mismanaged, and the overuse of the sea's natural and marine resources continues to be a problem. This misuse speeds along and/or confounds natural processes. The actual geography has also been altered by the building of dams and canals. 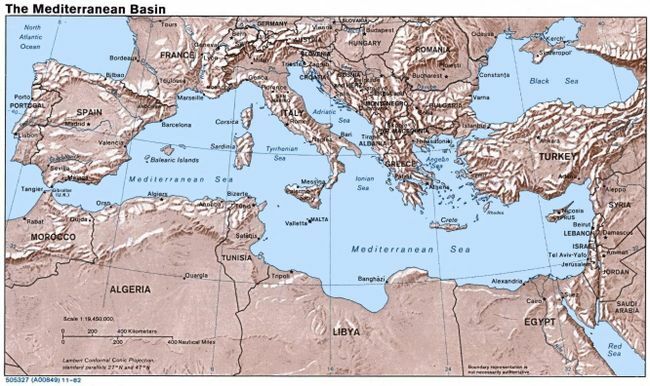 The Mediterranean was once thought to be the remnant of the Tethys Ocean. It is now known to be a structurally younger ocean basin known as Neotethys. Neotethys formed during the Late Triassic and Early Jurassic rifting of the African and Eurasian plates. The opening of the Suez Canal in 1869 created the first salt-water passage between the Mediterranean and Red seas. The Red Sea is higher than the Eastern Mediterranean, so the canal serves as a tidal strait that pours Red Sea water into the Mediterranean. The Bitter Lakes, which are hypersaline natural lakes that form part of the canal, blocked the migration of Red Sea species into the Mediterranean for many decades, but as the salinity of the lakes gradually equalized with that of the Red Sea, the barrier to migration was removed, and plants and animals from the Red Sea have begun to colonize the eastern Mediterranean. The Red Sea is generally saltier and more nutrient-poor than the Atlantic, so the Red Sea species have advantages over Atlantic species in the salty and nutrient-poor Eastern Mediterranean. The construction of the Aswan High Dam across the Nile River in the 1960s reduced the inflow of freshwater and nutrient-rich silt from the Nile into the eastern Mediterranean, which has made conditions there even more like the Red Sea. This species exchange is known as the Lessepsian Migration, after Ferdinand de Lesseps, the engineer who oversaw the canal's construction.